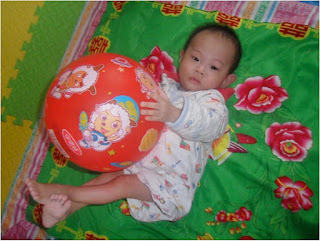 Yesterday we learned that we had been pre-approved by the Chinese government to adopt Cooper. What the pre-approval means is that the Chinese government has associated our names in official correspondence, we have his physical address so we can send a care package, and the Chinese government is moving forward to finalize our official approval. When we first gave notification that we were planning to adopt Cooper, our agency asked us if we were willing to sponsor him while he was still under Chinese government care. Of course we said yes. Apparently CCAI sponsors lots of kids, and Cooper is one of them. When you are a sponsor, you get quarterly updates from the foster care provider on your sponsored child. We are now his official sponsors, and now we can say that we are already providing for little Cooper. Once CCAI gave us access to his "sponsorship" file, we got to see his previous three quarterly updates. There were some new photos and some new information, but most was information we already knew. Here is his 9-month old photo. The process is exciting, but we have more time to wait. Christmas is here and we can't help but smile and think about next Christmas... with Cooper. After waiting 5 years and not willing to wait any longer, two weeks ago we contacted our adoption agency - Chinese Children Adoption International (CCAI) - and told them we had decided to move our place in line from a "standard" adoption to a "waiting child" adoption. We filled out a medical checklist of conditions we are willing to accept ranging from blood disorders to congenital heart disease to cleft lip/palate. It was a difficult process, but in the end we were both confident in our selections and were excited about the opportunity to move ahead in our adoption. Since we have waited so long, our immigration paperwork and our home-study had both expired, so we started the process to update that information from 2006. During the week, while doing research on what to include in our home-study update, I had been surfing CCAI's website to see the kids who hadn't made anyone else's checklist. One little face kept popping back up. Ronda actually caught me looking at his file twice. A boy? We have been waiting and planning for a girl for five years! After some discussion, we decided to ask for more information. What we got was a pretty significant amount of medical information which raised more questions. We both went into research mode to figure out what it was that he had and how it is treated. I actually called the Denver Children's Hospital and was eventually placed in touch with a GI specialist who agreed to look at his file. I emailed the doctor all the information and the next day he called me back and said that we should consult with a pediatric surgeon. I made an appointment with a pediatric surgeon - a "bowel specialist" according to the receptionist who made the appointment for me. He was born on January 1, 2011 with his intestines on the outside of his stomach. It is a condition called Gastroschisis. He did have a surgery shortly after being born, but he still has a significant belly. It's essentially a really big hernia in his stomach. It is troubling to see on such a small boy because it doesn't appear to be real. It's big. He will eventually have to have at least one more surgery. We can't share the videos or photos because they technically aren't ours yet. You can view the public file on CCAI's website here. According to the surgeon, most children born with Gastrischisis don't have other conditions (heart problems, brain issues, blood issues, etc.). He actually said that you could go to Las Vegas and bet on it and you'd come home a winner. His words, not mine. But apparently even doctors like to gamble, and he seemed up to this challenge. I promised CCAI that we would make our decision following our meeting with the surgeon, so we had a decision to make. So we made it. We called CCAI today and told them that we have decided to add him to our family. We have lots of paperwork to do, preparations to make, travel plans and finances to get in order, and waiting to do... more waiting. But now we know what we are waiting for. Our son, Cooper James.